Mona was one of the five people to receive a Christmas card from the child bride and me. Perhaps, like Goo, she displays it proudly in her home and tells everyone that my wife is her ex-girlfriend. Indeed, that sort of saucy international rumor alone would be thanks enough for the cheesy card that was sent, but Mona decided to do one better. Clearly gunning to eliminate the last vestiges of my old animosity France, she sent me a card! 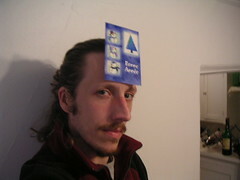 As anyone would do with a card from France, I immediately stuck it to my forehead and took a picture of myself for the whole word to see. The thing I really liked about this card is that the envelope that it came in said: "Open only with beer in hand (but don't spill any)!" Thank you Mona, you are a woman of my own heart. Of course, I followed the directions on the envelope -- I poured myself a pint of Guinness extra stout before ripping into it (keen observers will also note that there is a bottle of Jameson in the background of the picture). The writing on the card is a bit fuzzy; it says "Bonne Année," which, I know even without looking it up, is French for "Happy New Year." In Spanish it's "Felíz año nuevo." In Welsh we say, "Blwyddyn Newydd Dda." However you say it, I hope you have a good weekend. Thanks for reading all my nonsense. This photo is unsettling. I can't quite put my finger on it. You look so... I don't know... car-thievy. Have you stolen a car? I wish to gratefully acknowledge receipt of a Cope Xmas Card (collector's edition, suitable for framing). When I first opened it I was all "Who the flog are these people?" But then I felt the warmth of recognition as I remembered I had stupidly given my home address to a complete stranger in North Dakota or Wiconsin or one of those places. Anyway, Merry Xmas to you, too. French cards stuck to your head, that is highly fashionable these days!!! Yep, also from Holland, I wish you EEN GELUKKIG NIEUWJAAR. And guess what? Due to the fact that I strongly dislike my new job, I am back in the blogging- world. I am not sure whether I am happy about my current state of life, but its good to be back. EEN GELUKKIG NIEUWJAAR and Blwyddyn Newydd Dda?? The Dutch and Welsh languages read like how I would presume Klingon would look if written; with few vowels and impossible to pronounce consonants(sp?) combinations. If I had to guess how to say happy new year in Klingon, i think it would be: CHAKKA JARGLUGG DDPDA IKT CACA!! ...and OF COURSE I noticed the bottle of Jameson in the backgound!! My eye shot right to it before I even noticed you had something on your face. Infact, I thought this post was going to be about how you got drunk and fell on top of some xmas cards. Alas, we are not so lucky. I'm with Goo - I noticed the Jameson before I noticed the card. Does this mean I'm an alcoholic, or merely a greeting card blind savant? I did think about looking at your posted photo with a "magnifying glass," if only because you always seem to ferret out the small details in my posted photos. In any case, I appreciated your card - you and Rachel look great in knitted goods. And since I didn't send a card, Merry Christmas and Happy New Year!